My week started in Manchester, where it was the warm up for what turned out to be the largest UKNOF meeting so far – UKNOF 27. In this case the “warm up” was the IX Manchester meeting, facilitated by LINX (who operate IX Manchester). This is, I think, the first time that UKNOF and one of the regional interest groups in the UK have teamed up and worked to co-locate their distinct, separate meetings on adjacent days in the same venue. It might have been a bit of an experiment, but I hope everyone agrees it was a successful one and we’re able to co-operate again this way some time in the future. Talking of the venue… what a venue! UKNOF attendance has been growing of late, and so to protect ourselves against ending up somewhere that couldn’t cope, we eventually chose Manchester Central Convention Complex. I remember going to help scout the venues for this meeting earlier this year. We looked at various places, small and large. Remember that last time we were in the North West (back in 2010 thanks to the kindness of Zen Internet) only 65 people attended. Even the most recent non-London UKNOF in January 2013 couldn’t break the 100-barrier (and that was with Tref hosting!). But, during 2013 we’d also had two bumper meetings at 15Hatfields in London and could see that we are definitely growing as a community, so we had to think big, and so we went with the venue that we felt could cope best with the unpredictability. Initially, we were somewhat awestruck, maybe even a little bit nervous, when choosing a venue like this. It hosts massive conferences, trade shows and events. It’s a serious venue. But we needn’t have worried, it turns out we’d made the right decision, and the space happily scaled up from a 60-odd person IX Manchester meeting to the 200+ person UKNOF the following day. UKNOF 27 turned out to be our biggest meeting so far. We had over 250 people register. Around 25 cancelled their attendance in the week leading up to the meeting, and around a further 20 no-showed on the day. We’d ordered catering for 210, a good guess I think! I’ve honestly not heard a bad comment about UKNOF 27. We had some fantastic, interesting and original content delivered by our speakers from within the community. I can’t thank them enough. Without them, without you, there is no UKNOF. The audio and visual support seemed to work well, but we also learned a thing or two which will be brought to bear at future meetings. The Internet access was nice and stable: we brought our own wifi infrastructure for the meeting, and used Manchester Central’s great external connectivity to Metronet as a “backhaul”. 8 wireless access points were used to provide adequate coverage across the rooms, where most meetings previously got by on two. As usual, fantastic support from Tom at Portfast for the connectivity, and Brandon from Bogons.net for our webcast, along with Will and Kay who do connectivity for large events such as CCC who helped set up the additional access points. Why was UKNOF 27 so successful? It was certainly a very easy venue to get to, regardless of how you wanted to get there. Plenty of parking space, easy access to public transport and an international airport just a short train ride away. Possibly even easier than a London venue? 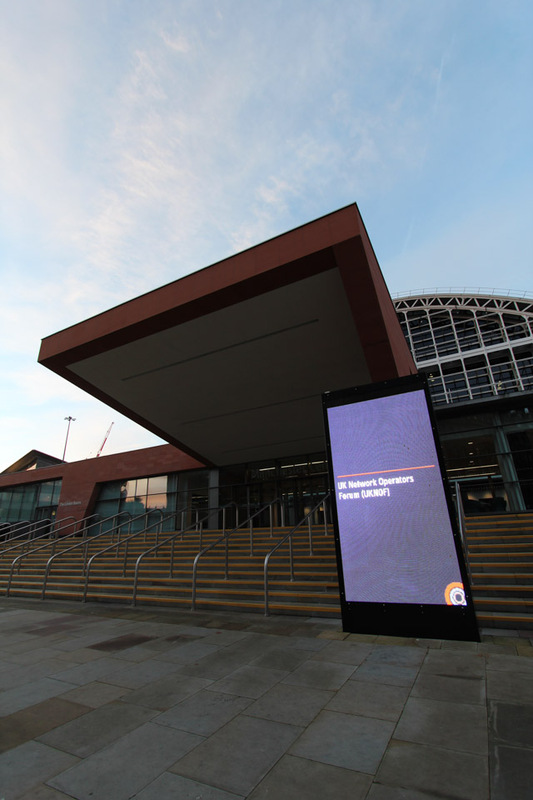 Did the simple act of holding UKNOF in a serious venue such as Manchester Central raise the profile of the event with those who were sat on the fence? There’s no doubt that the content itself was attractive, especially if (the lack of) bandwidth use was anything to go by. The food offering from Manchester Central’s own in-house kitchens I thought to be superb, hope others agreed! All prepared from scratch in-house, even the biscuits for the coffee breaks, a definite cut-above a shipped-in offering. I felt you could taste the difference. Maybe the co-location with the IX Manchester meeting meant that some folk stuck around for the extra day (and vice-versa)? …maybe there really are more Internet geeks in the North than the South these days? Or if we’re going to have that level of influence, it’s just that our thrice-yearly get-together of Internet geeks is coming of age. That said, I promise that we’ll stay true to our mission of “distribution of clue” and keep our focus on grass-roots Internet engineering and development. Thanks to everyone who attended, sponsored, spoke, asked questions, or helped us in any way to make UKNOF 27 the success it was. For those of you who enjoyed us being in Manchester, the good news is that we’re looking at a potential return there in 2015. Was a v interesting set of talks. Have you looked at the geographic spread of the attendees? We’re doing a bit of post-processing, but I don’t know we get much detail about which city people come from. We’ll probably have to do some guesswork and googling.